NOTE: Padula Oblongata is no longer an active band. 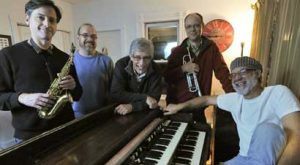 Grounded by the unmistakable sound of the Hammond B3 organ, driven forward by drums and percussion with trumpet and sax blowing melodies over the top, Padula Oblongata has a distinctive and irresistible sound. Starting you off with straight-ahead standards by the likes of Miles, Mingus and Monk, spicing it up with the funkiness of Hubbard and Harris, then stretching your musical boundaries with the musings of Coleman and Sun Ra, this five piece band will satisfy your ears and light a spark under your feet. One of the few Jazz Stage acts named by The Other Paper as a Best Bet at Comfest, Paduala Oblongata did not disappoint. Michael began playing the accordion at the age of eight and performed on the organ in a nightclub (chaperoned by his father) when he was 15 years old. In 1972, Michael got his first break after auditioning for the Platters and traveled with the group for several years. In the late 1980’s, Michael had the opportunity work with Jon Faddis and Ernie Watts while earning a BA degree in Biblical and Religious Studies at Abilene Christian University. Michael earned his Master of Divinity degree from Methodist Theological School in Ohio and pastors a local church in Mount Vernon where he lives with his wife, Rebecca. Michael and Rebecca have six children between them, 10 chickens, a dog and cat, and two hampsters. Ted Buehrer teaches jazz studies and music theory at Kenyon College in Gambier, Ohio. He holds a masters degree in jazz studies and a doctorate in music theory, both from Indiana University. As a performer he has had the opportunity to work with and learn from jazz greats Louis Bellson, Freddie Hubbard, and Betty Carter as well as teachers David Baker and Dominic Spera. He enjoys sharing his knowledge and passion for jazz with his students, especially those in the Kenyon Jazz Ensemble, which he leads. Ted’s academic research investigates the compositions and arrangements of jazz pianist and composer Mary Lou Williams. Skip Trask has been playing drums since the 5th grade. He began by beating on cardboard boxes and pots and pans at an early age. Skip played in his high school band as well as various garage bands in his youth. Skip is a father of three, lives in Mount Vernon with his wife, Holly, and works as a video editor for the Ohio Division of Wildlife. Ed’s playing is rooted in his study of folkloric Cuban and Haitian music with the likes of John Amira, Michael Spiro and Eric Paton. With like-minded drummers he helped found the Kata Bomba Drummers, which has been bringing these rhythms of the Caribbean to the Columbus area for nearly 20 years. Ed honed his craft accompanying Afro-Caribbean, Katheryn Dunham Technique, Orisha, and Rumba dance classes in the Columbus area, and now brings his traditional rhythmic vocabulary to the jazz of Padula Oblongata.